The Sanyo VIP Ultra Low Temp Freezer MDF-U76VA-PA provides you with optimized storage and reliable cooling with an eye towards balancing performance with efficient energy management. This ULT freezer takes a unique approach to cooling by holding refrigeration power in reserve for fast recovery after door openings, giving you 99% reliable temperatures. 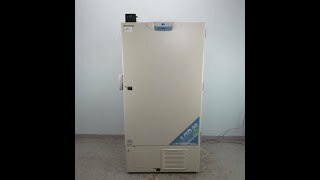 This upright lab -86°C upright lab freezer is powered with PHC compressors, combined with VIP vacuum insulation panels for an overall uniformity of +/- 5°C throughout the cabinet. This vacuum insulation is highly efficient and maximizes the capacity of this ultra low temp freezer, holding up to 576 2” boxes in a 9.48 sq ft instrument footprint. The Sanyo VIP Ultra Low Temp Freezer MDF-U76VA-PA is microprocessor controlled and has an eyelevel display for easy viewing. From this control panel users can set their alarm parameters, temperature preference in 1° Increments, monitor statuses, access data logging functions and view predictive performance. The interior of the Sanyo VIP Ultra Low Temp Freezer features two insulated chamber doors that aid in keeping cold air loss to a minimum at openings while also extending the amount of time to warm up in the event of a power outage. This Sanyo VIP Ultra Low Temp Freezer -86°C CAT# MDF-U76VA-PA has been fully inspected and is operating without issue. All of our lab equipment comes backed with our standard warranty. Should you have any questions about any of our lab freezers, please don't hestiate to contact us.